Here at Passfield Panel & Paint our technicians are experienced in repairing vehicle body damage. Our technicians have more than 22 years experience in the trade and are trained in fully restoring vehicle damage such as accident repairs, car park damage or bumper scuffs. Even the most minor of cosmetic damage can reduce the value of your car. Our technicians can ensure that your vehicle will leave our garage in complete pristine condition. For a quick, convenient and reliable paint spraying service, choose Passfield Panel & Paint. From a single panel to a full re-spray our paint sprayers are happy to take on any size project. We utilise our own mixing equipment to ensure that we can achieve a like for like colour match. If you require a vehicle polishing service we can do that too. You can have confidence in our service, as we have more than 22 years experience in repairing and spraying vehicles. We're your local alloy wheel refurbishment service in Dunstable. We utilise the latest in technology to allow our team of experts to get your alloy wheels back into the immaculate condition they once were. Alloy wheels are often scuffed and damaged when they come into connection with kerbs. Our experienced technicians specialise in complete alloy wheel refurbishment and are able to return your alloy wheels to their original state. 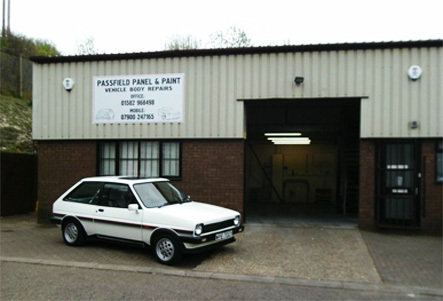 Here at Passfield Panel & Paint we take pride in offering a high quality cosmetic car repair service that is second to none in the Dunstable area. From our fully equipped garage in Dunstable we can repair, restore and refurbish your car to it's former glory. From simple scratch repairs and alloy wheel refurbishment we make sure your car leaves our garage in complete pristine condition. We have more than 22 years experience in the car body repair trade and are also fully qualified Mercedes vehicle refinishers. Full vehicle body repairs, vehicle paint spraying and alloy wheel refurbishment are some of the many services that we are able to offer from our vehicle body repair garage in Dunstable. From a full polishing service to give your car back that new car sheen to complete bumper scuff repairs we can complete any vehicle repair project. We are your local accident repair centre in Dunstable where our skilled technicians are able to complete any repairs required following road traffic accidents. For a trusted and reliable accident repair service, choose Passfield Panel & Paint. We are happy to take on any project or any car so don't hesitate to contact us today or drop by our repair and restoration garage in Dunstable to receive a full free quotation.